Everywhere in Minnesota's feeling the effects of climate change. And the warming climate affects each of those places a bit differently. Northern Minnesota's Lake Superior shoreline is no exception. This region of the state is especially threatened by warmer temperatures and more rain and snow. The region's economy and lifestyle depend on consistent cold and snow in the winter for skiing and snowshoeing; and pleasant summers for camping, swimming or hiking outdoor recreation. • Lake Superior: MPR hosts pop-up concerts on the shore of Minnesota's "Most Loved Lake"
Conversations about climate resilience became especially prescient for Duluth last fall when a storm tore through Canal Park, ripping up parts of the lakewalk and ravaging the prime tourist destination. 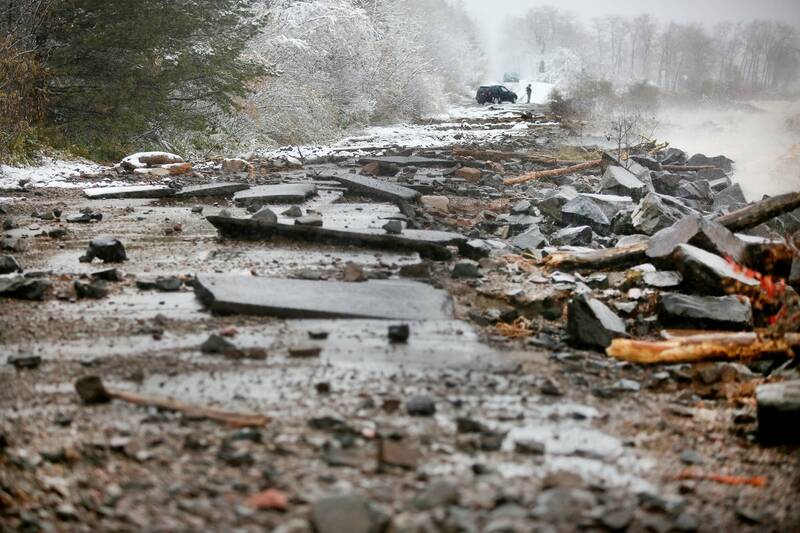 Observers blamed climate change for the storm's intensity. While it's difficult to ascribe climate change as the cause for a single weather event, there is hard science tying a warmer climate and more extreme weather. This one's pretty simple: temps are higher. It rains more. DNR data go back to 1895. Between then and 2017, Minnesota has gotten 2.9 degrees warmer on average and 3.4 inches wetter. Northeast Minnesota warmed by 0.61 degrees every decade between 1970 and 2017. It's only getting more extreme in recent decades. Each of the ten warmest and wettest years on record were between 1998 and 2017, according to the DNR. Climate projections say that trend will continue. Sometimes the increased wetness isn't enough to keep up with the warming, Blumenfeld said, and that can have detrimental effects. "In parts of northeast Minnesota, we're still kind of losing forests from drought-like effects," he said. The cold months aren't so cold, especially when they used to be coldest: nighttime. "We are seeing warmer winter days, but the real driver is the loss of cold nights," Blumenfeld said. Since 1970, Minnesota winters have warmed 13 times faster than summers, according to the DNR. Some of the fastest warming is in northeast Minnesota, Blumenfeld said. Plus, the coldest of the cold just doesn't come to Minnesota. Minus 60 temps don't happen anymore, he said. And the state hasn't seen 50 below in over a decade. "Negative 50 is brutal. It's extremely cold. Nobody misses it, really, but it's something that we used to see pretty dependably in here Minnesota," Blumenfeld said. Usually, he said, it was on the ridge up from Lake Superior. Ask North Shore residents and they'll probably tell you it's getting wetter. There's data to back it up, too. The DNR has 40 weather-observation sites that have daily records for more than a century. "These long-term stations have shown a 20% increase in the annual number of 1-inch daily rainfalls, a 65% increase in the number of 3-inch rainfalls, and a 13% increase in the size of the heaviest rainfall of the year," the DNR says.